The problem of contact lens dropout continues to affect the contact lens industry, with discomfort cited as the primary reason for discontinuation among lens wearers [1,2]. The underlying causes of contact lens discomfort are many and varied, as noted in a recent TFOS report summarising the problem . In this, the authors attributed discomfort to factors related to the ‘lens’ (including lens material, design, fit and the lens care system/packaging used) and the ‘environment’ (including inherent or modifiable patient factors as well as ocular and/or external environmental factors). It stands to reason that a poorly fitting lens will adversely affect comfort; however, of the factors relating to lens fit, relatively little work has been published in relation to ocular topography and soft contact lens fit. Selection of the initial lens base curve has traditionally been based on central corneal curvature alone, as obtained by keratometry. This is based on the assumption that steeper corneas have greater sagittal height and therefore require a lens of greater sagittal depth in the form of a steeper base curve to fit the cornea. Ocular sagittal height, though, is governed not just by central corneal curvature, but also by corneal diameter, corneal eccentricity and scleral profile. Consequently, studies have shown keratometry to be a poor predictor of soft contact lens fit [4-6]. A 2010 study  subsequently attempted to better predict lens fit using the extra topography data gained from videokeratoscopy; however, this showed only weak correlations between the corneal topography and lens fit. Given that the greatest change in ocular profile occurs at the limbus, it seems likely that this area will have the greatest influence on soft lens fit because this is where lenses are required to flex most to align to the ocular surface. 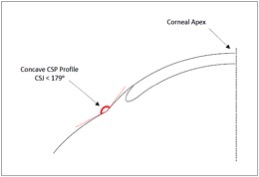 Information on the topography of the peripheral cornea, the corneo-scleral junction (CSJ) angle and the limbal sclera, which together form the corneo-scleral profile (CSP), has been scarce until recently. Advances in imaging technology, such as AS-OCT and profilometry, have enabled us to characterise this part of the ocular profile more accurately. In a 2013 study, Hall et al  used AS-OCT to measure and evaluate the CSPs of 204 subjects. 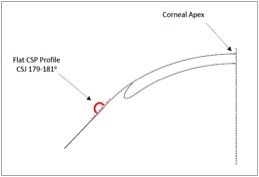 Limbal transition zones with CSJ angles of less than 179o were classified as ‘concave’ zones, those with angles of between 179o and 181o were classified as ‘flat’ and those with angles of greater than 181o were classified as ‘convex’ (Figure 1). 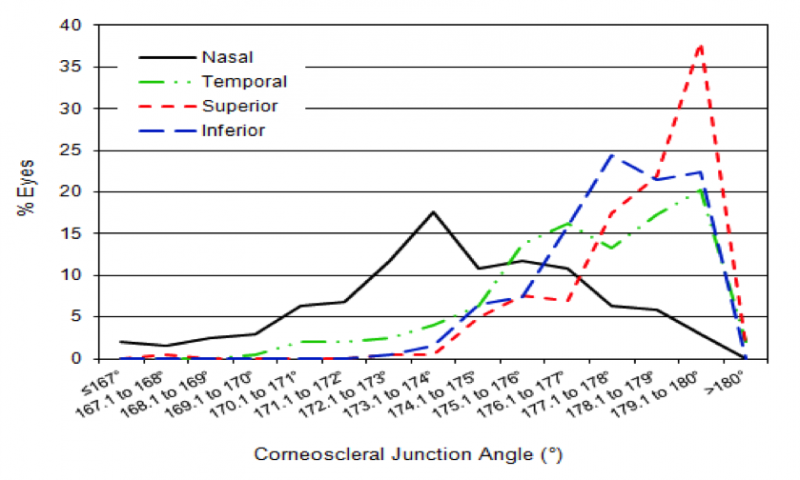 They found that the mean CSJ angle tended to be sharpest at the nasal CSJ (172.3o) and became progressively (and significantly) flatter at the temporal, inferior and superior junctions (Figure 2). Interestingly, they also found that approximately a quarter of all CSJ angles were within ±1° of 180o (i.e. 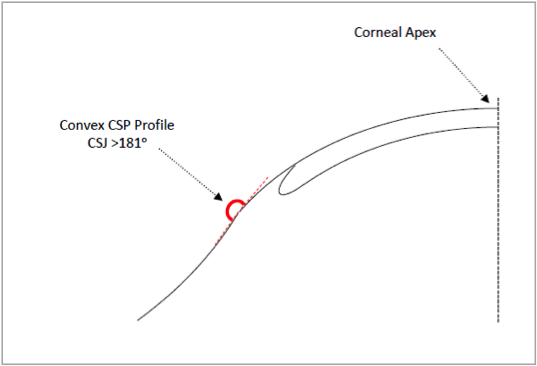 forming a ‘flat’ transition from the cornea into the sclera), and that over 77% and 97% of all CSJ angles were within ±5° and ±10° of 180°, respectively (Table 1). These findings show the rotationally asymmetric nature of the limbus and anterior sclera, and they suggest that the deformation of the lens in this area is likely to be asymmetrical, too. In a different study , the same group related soft contact lens fit to the central corneal and peripheral ocular profile and managed to predict up to 24% of the variance in certain lens fit parameters; this still, however, left a further 75% of the variance in lens fit unaccounted for. More recently, Young  has described the use of mathematical modelling to better understand the factors governing soft lens fit. Based on the work of Kikkawa , who proposed a mechanical model of lens fit in which the peripheral portion of soft lenses acts like a series of concentric elastic rubber bands that progressively stretch to accommodate changes in the peripheral ocular curvature, this employed a novel ellipto-conical corneal model to calculate lens edge strain as a predictor of lens tightness on eye. This approach seems very promising, although the model currently assumes a cornea of equal horizontal and vertical diameter. Recent advances in imaging technology and improved modelling have allowed us to more accurately predict the behaviour of soft contact lenses on eye, with the aim of improving comfort for lens wearers. Much of the behaviour of soft contact lenses, however, remains a mystery, and more work is required in this area. Dumbleton K, Woods CA, Jones LW, Fonn D. The impact of contemporary contact lenses on contact lens discontinuation. Eye Contact Lens. 2013;39(1):93–9. Richdale K, Sinnott LT, Skadahl E, Nichols JJ. Frequency of and factors associated with contact lens dissatisfaction and discontinuation. Cornea 2007;26:168–74. Gundal R, Cohen H, DiVergillio D. Peripheral keratometry and soft contact lens fitting. Int Eyecare. 1986;2:611–613. Hansen D. Evaluating the eye with corneal topography. Cont Lens Spectrum August. 2003:27–32. Hall L.A, Hunt C, Young G, Wolffsohn J. Factors affecting corneoscleral topography. Invest Ophthalmol Vis Sci. 2013;54, 3691-3701. Hall LA, Young G, Wolffsohn JS, Riley C. The influence of corneoscleral topography on soft contact lens fit. Invest Ophthalmol Vis Sci. 2011;52, 6801-6806. Kikkawa Y. 1979. Kinetics of soft contact lens fitting. Contacto, 23, 10-17. Young G. Mathematical model for evaluating soft contact lens fit. Optom Vis Sci. 2014 Jul;91(7):e167-76.